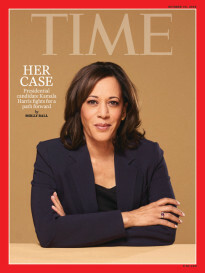 The Oct. 24 issue of TIME may look a little familiar to some readers. In order to capture the latest twists in Donald Trump’s campaign and the rising anger within the Republican party leadership about their standard bearer’s behavior, we asked artist Edel Rodriguez to reprise his illustration of Donald Trump which appeared on the Aug. 22 issue of TIME—this time with just one small twist. (Read TIME creative director D.W. Pine on the impact of Rodriguez’s original image.) Rodriguez was formerly an international art director for the magazine and has since completed a variety of covers for TIME, including the cover that followed the 2015 attacks on Paris. This week mark’s the sixth time—and the fifth since he launched his presidential campaign in June 2016—Trump has been on magazine’s cover. The businessman first appeared on the cover in 1989. By comparison, Trump’s opponent Hillary Clinton has appeared on TIME’s cover 31 times; she was first on the cover in September 1992 when her husband Bill was two months away from winning the White House. The Aug. 22, 2016 issue of TIME. The Jul. 25, 2016 issue of TIME. The Mar. 14, 2016 issue of TIME. The Jan. 18, 2016 issue of TIME. 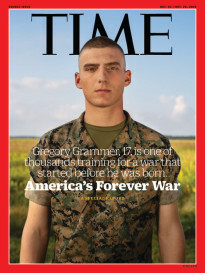 The Aug. 31, 2015 issue of TIME. The Jan. 16, 1989 issue of TIME.